Otrio is a tic tac toe board game with triple the complexity and visual appeal of the traditional game. 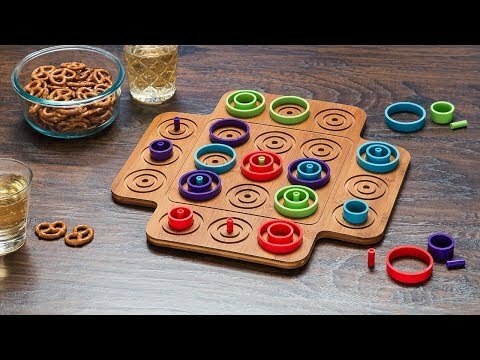 The board’s nine squares each have three concentric circles, and players get different-sized circular pieces that they can play inside any square. This creates multiple ways to win: getting three of the same-sized pieces in a row, three different-sized pieces in a row in ascending or descending order, or three concentric pieces in the same space. With added layers of strategy, this game engages its players in active offense and defense. Dimensions: Original: 15.3" x 15.3" x 2.25"; Lite Edition: 11.38" x 11.5" x 2.0"
Enjoy playing when I can get someone to play with me. And I usually lose! Otrio is an edgier, more complex take on the classic tic tac toe board game. With added layers of strategy and multiple paths to victory, we like to think of it as tic tac toe's cooler grandkid. Each of the board’s nine squares has three concentric circles and each player gets nine corresponding circular pieces of one color. Players take turns placing one piece in any one of the circles. There are three different ways for you to win: three same-sized pieces in a row like in the traditional game; three different-sized pieces in ascending or descending order; or three concentric pieces in the same space. All of these possible ways to win mean you’ll have to constantly multitask and plan ahead. 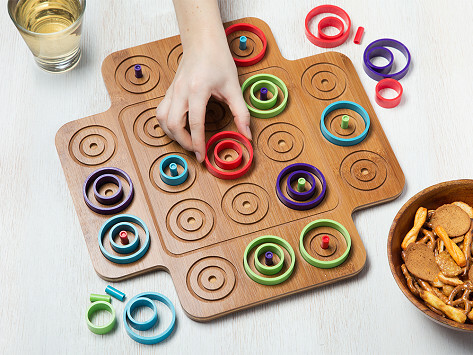 And, as the game progresses, the colorful circular pieces create an artful, vibrant display.